PG athlete Abe Studler (far left) took second place in the NorAm Finals Duals comp, a huge result for him in a super competitive international field. KILLINGTON — Crowds gathered under bluebird skies both Saturday and Sunday March 5-6 at the base of Killington’s mogul venue on Highline to watch Freestyle athletes from all over the world compete in singles and duals events in what was the final stop of the NorAm Tour. Killington Mountain School’s Abe Studler threw down amazing runs on Sunday to take second place in the Men’s Duals in what was an extremely competitive field of athletes. Studler, who hails from Brant Lake, N.Y., turned in his best performance in a NorAm to date, finishing solidly between the US Team’s Troy Tully in first and Team Canada’s Laurent Dumais in third. 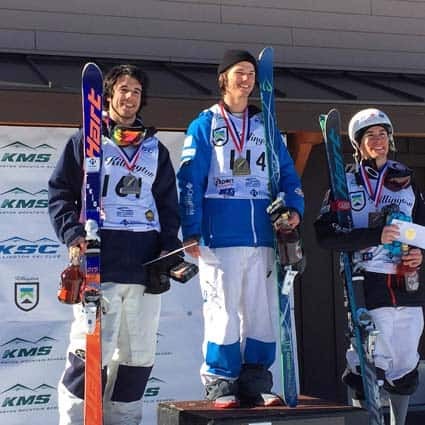 Studler, surrounded by enthusiastic family members, friends, teammates, and home-mountain supporters, was clearly pumped about his performance, “I am super excited to have landed my first NorAm podium and even more so to do it at my home mountain. Second place is a big step in my career, and I am glad that it came with the last event of the Grand Prix Tour to set me up well for upcoming championship events,” he said. Studler and his teammates have positioned themselves to end their season on a strong note out west as they feed off the powerful momentum they built at Killington this weekend. The team will travel to Steamboat Springs, Colo. for U.S. championships after competing in Sun Valley this coming weekend.